never fear, intuition is here. One of the biggest challenges I run into when I am teaching Intuitive Development is how spooked people can get when they experience how REAL Intuition is. It’s one thing to muse about Intuition. It’s quite another when it reaches out and touches you for the first time. But, with Intuition, there is nothing to fear. INTUITION IS THE OPPOSITE OF FEAR. IT IS THE EMBODIMENT OF TRUST. It is our connection to the highest, loving Truth of the Universe. That is not a place of fear. The image above is a testament of just a few of the many, many super smart people throughout History who understood that Intuition is the secret to unlocking our innate genius and wisdom. Intuition is a gift, like any other talent. Learning to master your Intuition is no different than learning to master Art or Music or Business…or any other human talent. Our Intuition is the key to our evolution as a species. It’s the final frontier. It’s the leading edge. Out of it comes inspiration, innovation, insight and our inner connection to conscious evolution. In the future, Intuition will be commonplace. It is a return to our natural, balanced state ~ as a compliment to our Intellect. When we, finally, learn to unite the processing power of our thinking mind with the receptive power of our divine Intuition, we will, at last, be fulfilling our potential as human beings. …and step into your power! Fear is only a tool of the ego to strip you of your sovereignty. Your true success will come when you step into the light of your highest being. Intuition travels on that light. 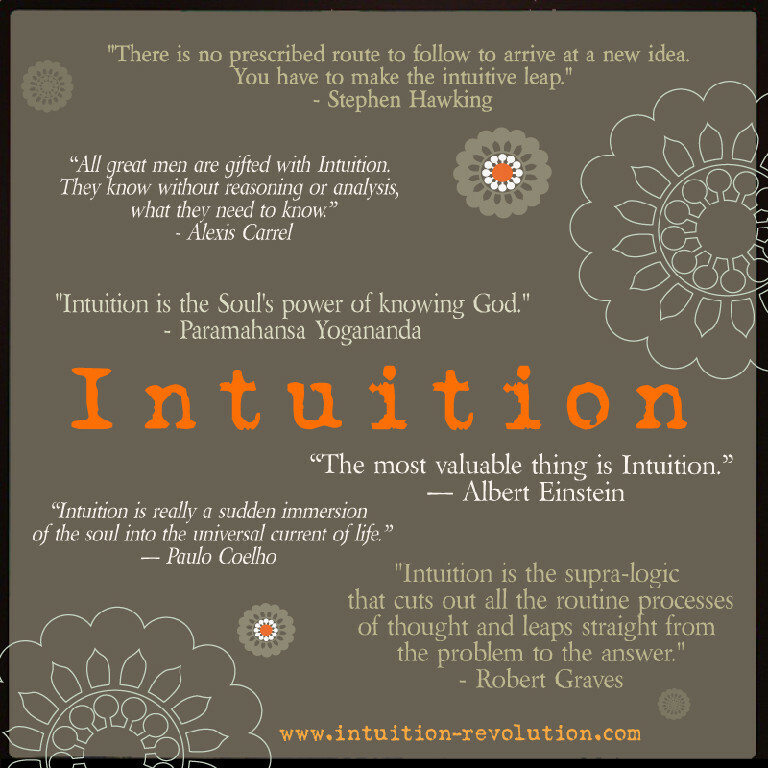 ABOVE AND BEYOND IT ALL, REMEMBER….YOUR INTUITION HAS YOUR BACK. It is your Higher Self. It is your connection to God. It is your connection to Trust…and Love…and Wisdom. All you need to do is follow it.